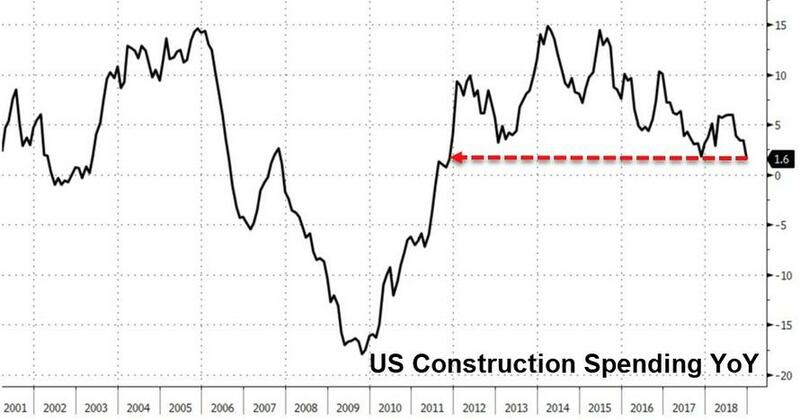 U.S. construction spending posted the smallest annual increase since 2011 as homebuilding slowed amid higher borrowing costs and a glut of apartments in some areas. For December, spending declined 0.6% from the prior month, missing forecasts for a 0.1% gain. Bloomberg notes that the full-year figure reflected a 3.3 percent increase in private residential construction that was the smallest advance since 2011. The category had posted gains of more than 10 percent for six straight years. Within the sector, single-family building was up 5.2 percent while multifamily housing rose 0.7 percent. Other areas of weakness in construction spending for 2018 included private manufacturing, which fell 1.7 percent. On the positive side, state and local outlays jumped 7.1 percent, the most since 2007.